Isn’t it a brilliant sparkly new year? It really is. -12C here (that’s 10F), it sure is frozen and sparkly out there. Right about now is the time I am THRILLED that I don’t have to leave the house to go sit in my frozen old car just to drive to a job that I hate.  Feeling so, so lucky as I start this new year. 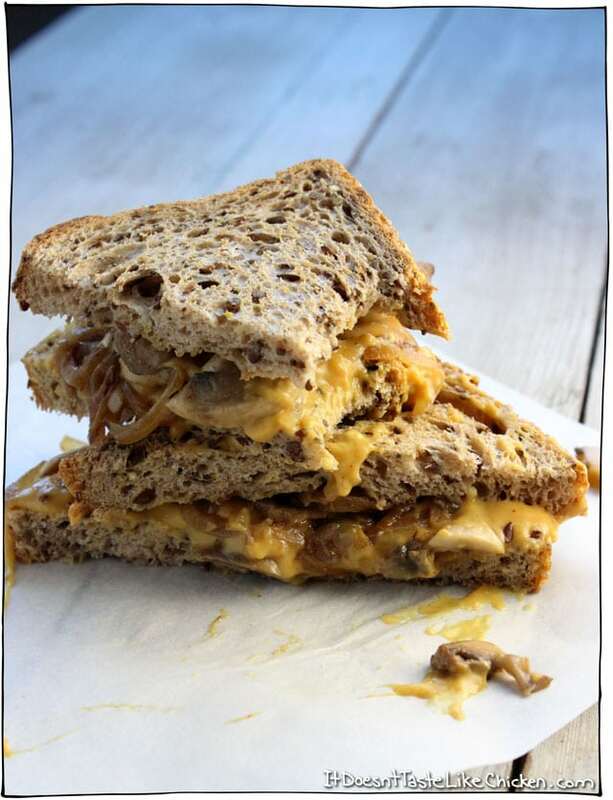 Last year, when I put together the Top 10 Vegan Recipes of 2015 I discovered two main things. #1: you guys love sandwiches and #2: you love anything ooey and gooey. So why not start the year off right. 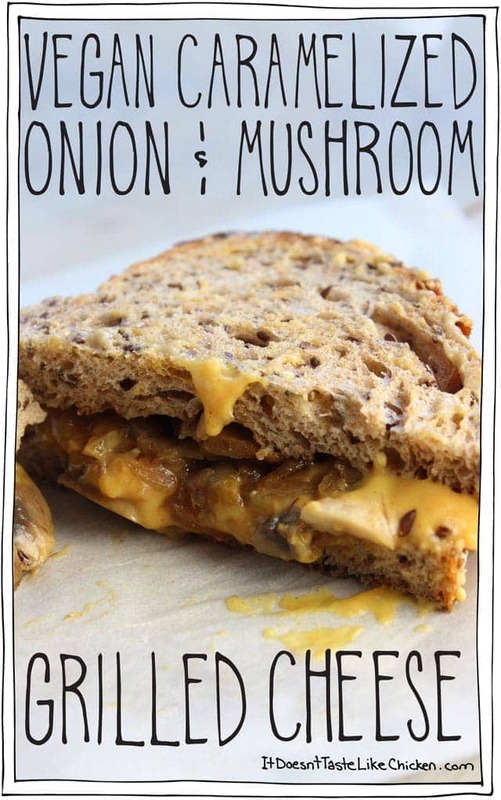 I present you will an ooey gooey sandwich, or as I like to call it, Vegan Caramelized Onion & Mushroom Grilled Cheese. Yes, all of those words smushed into one scrumptious hand held food. Mhmmm, hello 2016 you are looking mighty, mighty fine. Perhaps you have tried my Vegan Mozzarella Grilled Cheese Sandwich. There we learned that vegans can have all the grilled cheese goodness they desire. And perhaps you have tried my Melty Stretchy Gooey Vegan Nacho Cheese. Where we learned that nacho cheese is a thing, a vegan thing, a delicious ooey gooey vegan thing. 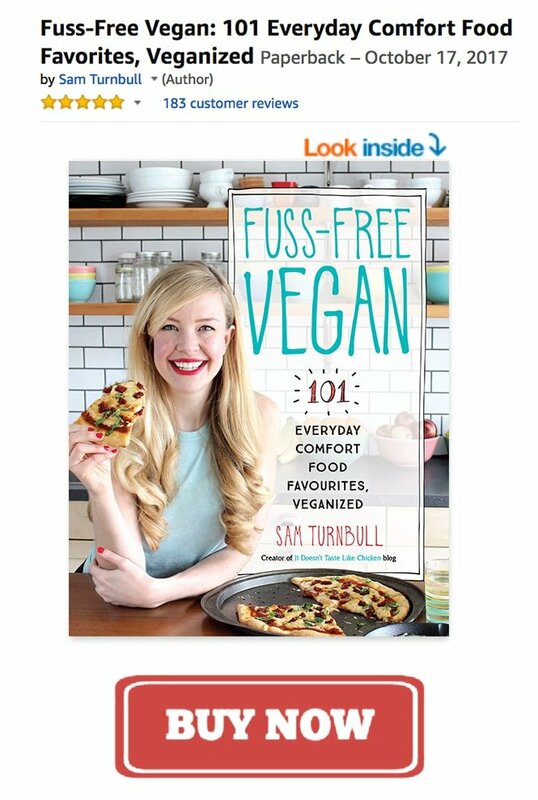 Now we are going to learn to take up a vegan grilled cheese a notch. 4 notches to be specific. Notch #1: combine the nacho cheese with notch #2: caramelized onions (are caramelized onions ever a bad idea!? 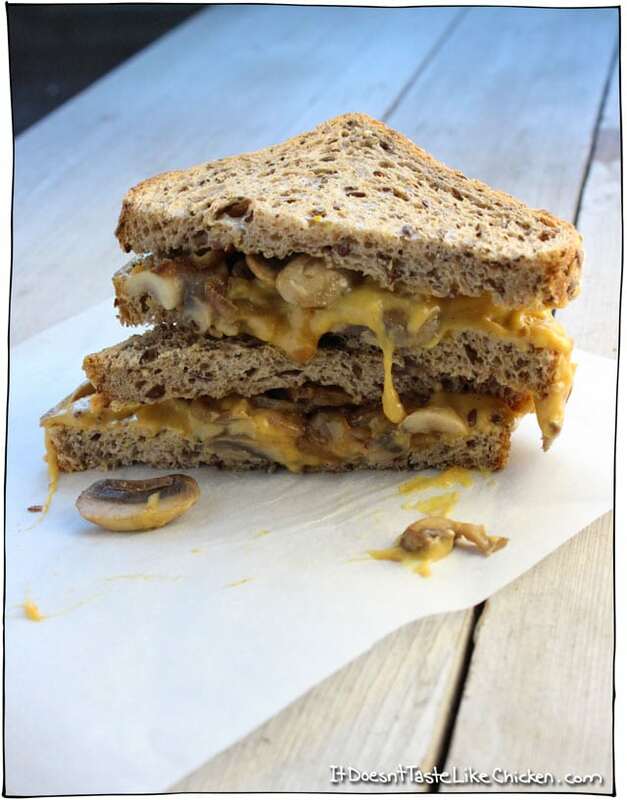 ), notch #3: sauté mushrooms, and notch #4: put it all on bread and grill it to toasty gooey perfection… GIVE IT TO ME NOW! To make this comfort food love, first you will need to prepare the recipe for Melty Stretchy Gooey Vegan Nacho Cheese. It only takes 15 minutes to make and can be made in advance. 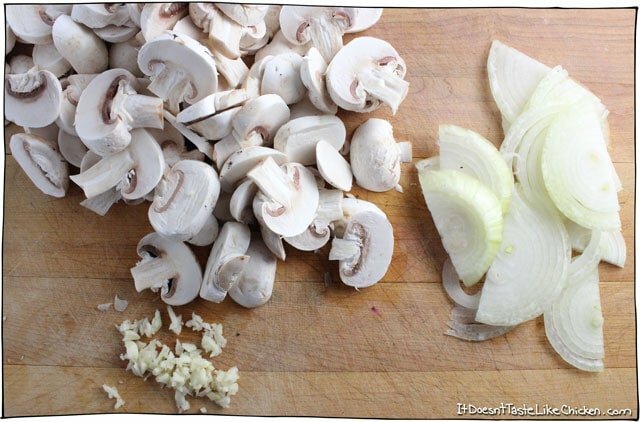 Then thinly slice your onions and mushrooms, and mince some garlic. Heat a bit of oil or vegan butter in a pan and sauté the onions for a couple of minutes until they become translucent and just begin to brown. Add in the mushrooms and garlic and continue to sauté until the mushrooms reduce in size, and everything looks all delicious and golden. Yes this is vegan, and yes this is insanely delicious! Comfort food that's healthy! Prepare the Melty Stretchy Gooey Vegan Nacho Cheese as per instructions. This can be made ahead of time if you prefer. Heat the vegan butter in a pan over medium heat. 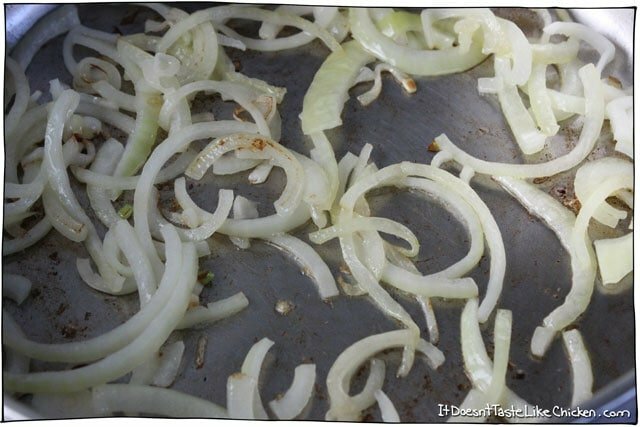 Add the onion and sauté for about 5 minutes until the onion becomes translucent and just begins to brown. Add in the mushrooms and garlic and continue to sauté until the mushrooms have decreased in size and browned up nicely. Remove from heat and set aside. Butter one side of each slice of bread. Spoon a nice helping of the mushroom and onion mixture onto 3 slices of bread (buttered side down), cover with the nacho cheese, and top with a remaining slice of bread (butter side up). Repeat with the remaining sandwiches. Heat a pan over medium heat, and grill each sandwich for a few minutes on each side, until golden brown. Serve while hot and gooey! OMG! This is making me drool! All your recipes I’ve made so far are so delicious. You need to have your own cooking show on Food Network or The Cooking Channel. I’ll pitch for ya! Yo Sam! Excuse my french, but this sh** was off the f’ng chain!!!! 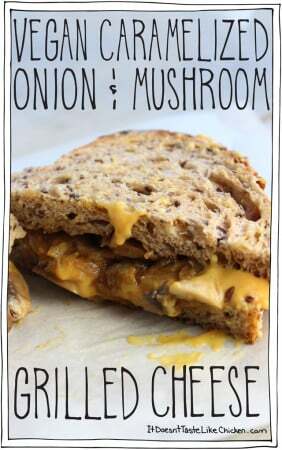 I’m not a huge fan of onions but when carmelized…. yummmmmy! Another great recipe! Thank you! Are you kidding me?!?!? Why did I never think of this, even in my non-vegan days? I made this tonight with your mozzarella recipe. It is so utterly delicious. Honestly, I think one of the reasons I think you are so awesome is because of your many mushroom recipes. I just received your cook book and I can’t wait to try all of the mushroom recipes. Unfortunately, my family does not share my enthusiasm. That’s okay, more for me. YUM!!! Made these for dinner, paired with the Creamy Macadamia Corn Chowder (it was “It Doesn’t Taste Like Chicken” night!). These were super awesome, and incredibly filling. Thanks for all your incredible inspiration, Sam. Been making this for year. However, I have added peppers and using homemade cashew cheese. Just had it for lunch today… yummers!!! What type of bread is in the photo? YUM! Love me some grilled cheese goodness! 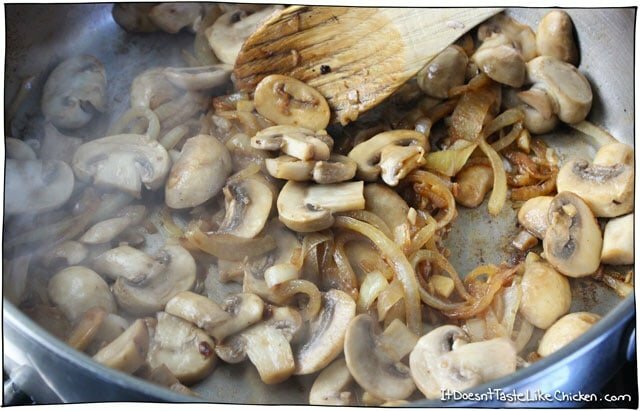 Caramelized onions and mushrooms go together to well, too! Love this, Sam! Thanks Amanda! How can you go wrong with grilled cheese, amIright? I am DROOLING over here. Must be time for lunch. Oh yes! Soup and grilled cheese, uh yes please! Oh yes, I think the mozzarella will work well here too 🙂 Enjoy! !